Jupiter 1 townhomes are Divosta style quads that have large fenced courtyards. 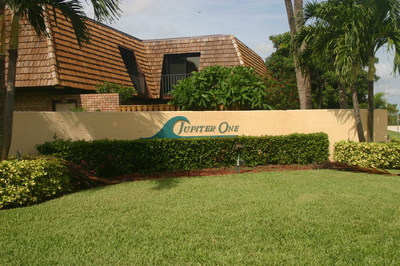 Located at 1420 Ocean Way there are 32 buildings and 128 townhomes in the community of Jupiter One. They are large 1,700 sq. ft 2 bedroom 2.5 bath townhomes with very spacious rooms. The most popular exposures are SE exposures for full time residents. The community is meticulously maintained and the location can't be beat. The most attractive feature of Jupiter One is they allow 2 dogs of any size so you will see quite a few Labs and larger breeds in the community. The fenced in courtyards are great for dogs and outdoor living including grilling . Jupiter 1 Townhomes are a short 5 minute walk to the beach. Browse listings for available Jupiter One Pet friendly townhomes, or Read more about this wonder beachside community. They have a community pool and a tennis courts. The rental policy is quite liberal with only a 30 day minimum with no limit per year. The community restrictions include no trucks or boats. They allow 2 dogs with no weight limit and have 1 assigned space and one guest space per unit. The low HOA fees also covers building insurance. They make a great vacation home or rental townhouse and are a great value along the Jupiter beach. Beach lovers and dog lovers, this is the perfect community for you. The Jupiter dog friendly beach is just a 5 minute walk past Olympus and Jupiter Ocean Grande on Ocean Way. Look at Jupiter One. With the close proximity to Jupiter Beach the townhomes are quite popular and favorites for the active owner. The Jupiter bike path and sidewalk are wonderful spots to exercise and meet local neighbors. The early mornings make great beach walks as well and don't forget the dog. They willl meet plenty of friends at the beach as well. Maybe a walk down along Jupiter Riverwalk in the evening and watch the setting sun. The location of the townhomes are located close to all your needs. With restaurants, food shopping, gyms and theaters less than a mile away. Enjoy the new Fresh Market or maybe dinner at one of the restaurants along Riverwalk on the water. Living here in this Jupiter beach community will be a great choice for the outdoor enthusiast. Finding townhomes near the beach can be difficult as most of the places are condos or single family homes. You may want to look Jupiter beach homes if you have a dog or try some of the Singer Island luxury condos.